I found this card in my trading card collection as I was going through some of my old trading cards. If I remember correctly, this card came with the Wizard magazine which I was very much into US comic in the early 1990s. 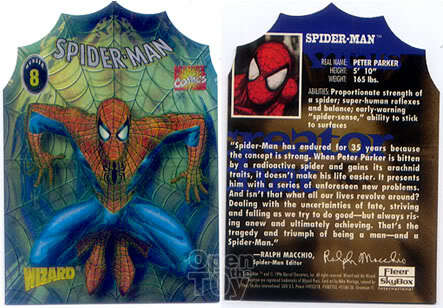 The card has a web like shape while the back of the card has a short write up of Spider-man and signature of Ralph Macchio, Spider-man editor. I think this card has to do with 35 anniversaries of Spider-man. Anyway the editor name is the same as the actor of Karate Kid, Ralph Macchio! That's something new I learned today. Anyone has this card in their collection too? I used to have that one too but I'm sure I cleared it out long ago - probably gave it to my nephew or something. LEon, I'm in the same boat as Bubba, I had it at one time, and you were right it was packaged with a Wizard Mag.